Complete your table setting with our Italian individual bowls. 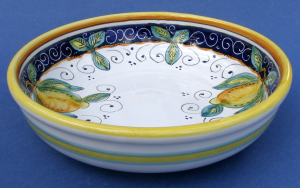 Our hand painted Italian ceramic individual bowls include: italian cereal bowls, italian soup bowls, italian salad bowls, italian dip bowls, and italian pasta bowls. All of our bowls and Italian pottery are directly imported by our company from Italy and then shipped directly to you from our USA location within approximately 1 business day.